This stunning five bedroom holiday house is awaiting your arrival. Just unpack and enjoy the tranquillity of the waterfront on your next holiday with your family or friends.! Accomodates eight adults and four children. This two storey home (with lift) has been designed to enjoy the breathtaking views of the Salamander Bay waterfront. Bring along your boat, kayaks or paddle boards. Please note the private boat ramp is not accessable with a car. Public boat ramp just a short drive away. On the ground level you will find the spacious kitchen, a chefs delight. With double ovens, multiple Miele and Smeg appliances and a view straight out to the water. Cookingmade easy! The first lounge room is upon entering the property, it has a 50 LCD TV and a corner lounge for the family. The second lounge room with a faux fire place, 60 LCD TV, Fetch Optus TV and a Bose Stereo system for more impact. There are threemore leather lounges, so there is room for everyone to relax and unwind. Superfast NBN WIFI is available throughout the property. So bring your Netflix, my Foxtel, or other streaming logins and away you go. There is one full bathroom with a shower and one additional toilet on the ground level, as well as the laundry with a front loadingwashing machine and clothesdryer. There is also an electric front gate and automatic double garage.The garage is suitable for one car and for storing personal items such as bikes, paddle boards, surfboards and other items. It also hasa large 2nd fridge. There is room to park two more cars in the driveway. Upstairs there are five generous bedrooms: sleeps 12 (max 8 adults). King bed, ducted aircon, ceiling fan, walk in wardrobe. LCD TV. A gorgeous ensuite with underfloor heating, double basins and a double shower, spoilt with the choice of a regular or rain water shower. The master bedroom also has its ownsitting area that receives abundant sunlight and complete water views. There is even a spotting scope to check out the regular visits from dolphins and pelicans! The Master Suite also has a large private balcony with a table and chairs to enjoy the stunning view and maybe a glass or two of something fizzy. Light filled room with a Queen bed, built in wardrobe, ducted aircon and a ceiling fan. Good sized room with a Double bed, built in wardrobe, ducted aircon and a ceiling fan. Standard sized room with a Double bed, ducted aircon, small wardrobe and a ceiling fan. Two sets of bunk beds (suitable for children only), built in wardrobe and ducted aircon. LCD TV. On the upstairs landing there is another lounge, an armchair and a coffee table, which is the perfect place for a game of chess, or to just relax and read that latest novel. There is also a large full bathroom upstairs with a bath and a shower. Take in the sunsets while cooking on the Gas BBQ and enjoying dinner on the outdoor dining setting. There is an outdoor shower with hot and cold water that is suitable for coming off the beach after a busy day enjoying swimming, fishing, stand up paddle boarding or just playing with the kids in the water. Close by is the Salamander Shopping Village which has multiple convenience stores like the Friendly Grocer (with ATM), Bottle Shop, Chemist, Newsagent, Bakery and several Restaurants. The Salamander Shopping Centre where you will find Coles, Woolworths and Aldi is a 5min drive away* These are approximate times only. Please note there is a $2000 security deposit applicable to this property. Please note if the lift is a necessity please call our office prior to booking this property. Horizons Golf Resort ranks in Australia’s Top 30 courses. Designed by Graham Marsh and Ross Watson, top professionals have enjoyed tournament golf here at Horizons. Spacious kitchen, a chefs delight. With double ovens, multiple Miele and Smeg appliances and a view straight out to the water. Cooking made easy! The property is gorgeous and the family had an enjoyable stay, however, the water was disgusting and I was especially disappointed with that... we organised paddle board but we couldn’t even use it because of the condition of the water. Thanks for the review and I am pleased you enjoyed the house. I am sorry the water in the bay was not at its best for you, we do sometimes get some seaweed blown in by the prevailing winds/tides etc. It is a shame you have only given a 3 star review based on something completely out of my control. Anyway, thanks for staying and all the best. 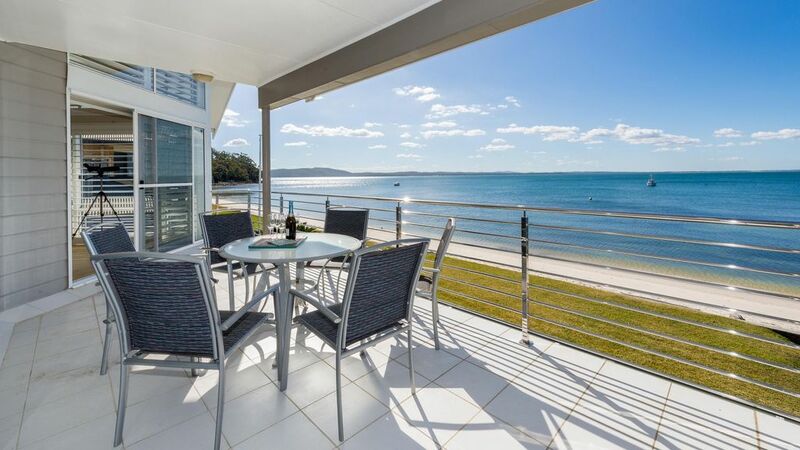 Great large family accommodation right on beautiful Salamander Bay. Excellent location on the water, kids could kayak and swim while we either joined them or watched over them from the comfort of the decks. So nice to not have to leave the property, and have the family with lots to do right in our own front yard. It is always great to hear that people enjoyed their stay and were kind enough to write a review. Absolutely stunning.. the house is amazing great location great features. Loved every minute there. Will definitely be back.